After 11 years in my old classroom, my administration decided to redo the large computer lab next to me & transform it into a second art room for our school. Since I teach 3rd grade up through High School Art, they decided it would become my room and I couldn’t be more thrilled! Now that I’m in the room, I literally stand in the middle of the room, twirl around & sing “the Hills are Alive…” (you know from Sound of Music). WE HAVE ROOM TO MOVE AROUND NOW!!! The school spent the summer tearing out the carpet, painting the walls, adding sinks, and installing cabinets-they were busy!! 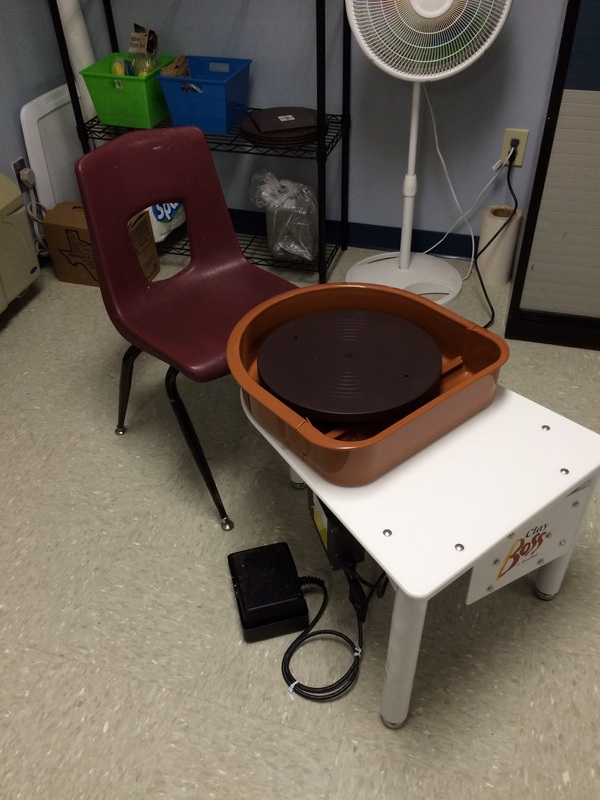 The blessings just kept flowing-they told me that I could order a THROWING WHEEL! YEAHHHH! What a blessing it is to be at a school that totally supports the arts and believes in the importance of teaching the “whole child”. I will say this up front-I am NOT an organizer! 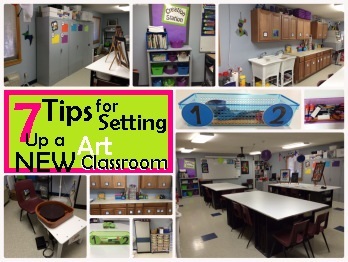 I rely heavily on Pinterest & other teacher’s for art room organization ideas. 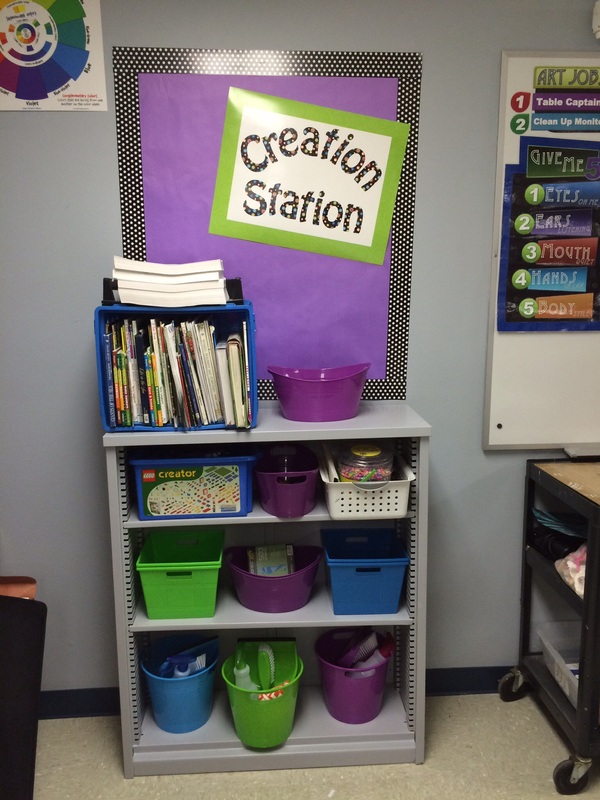 Setting up an environment that is welcoming and organized is calming to the students! The one thing I did know was that I needed a limited color scheme, so I went with Cool colors-Purple, Blue & Green. 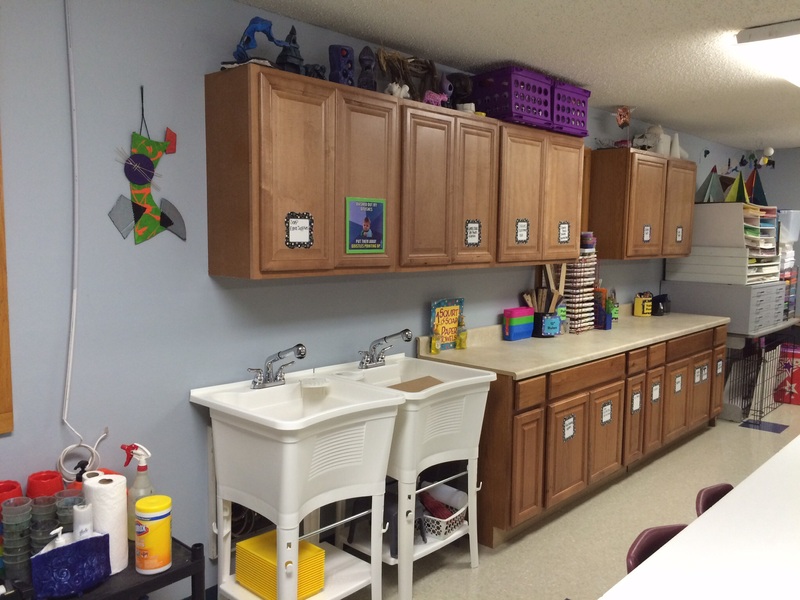 They had already painted the walls, so I needed a color scheme that would blend well with the slate blue walls. So I used gray & black too. I paid my kids to paint all the metal cabinets and shelves gray to give them a unified look (gotta LOVE cheap labor 🙂 ). 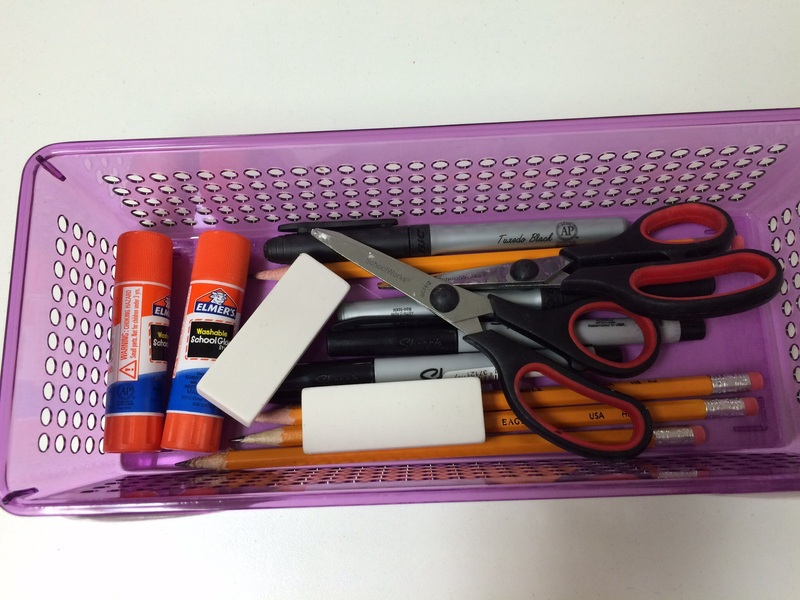 Make regularly used supplies easily accessible to students (like pencils, erasers, scissors, glue sticks-I have baskets on the table with these supplies). Find out your biggest class size and plan the room to accommodate that many students. I always plan for at least 18×24″ minimum working pace for each student (especially 5th grade & up). 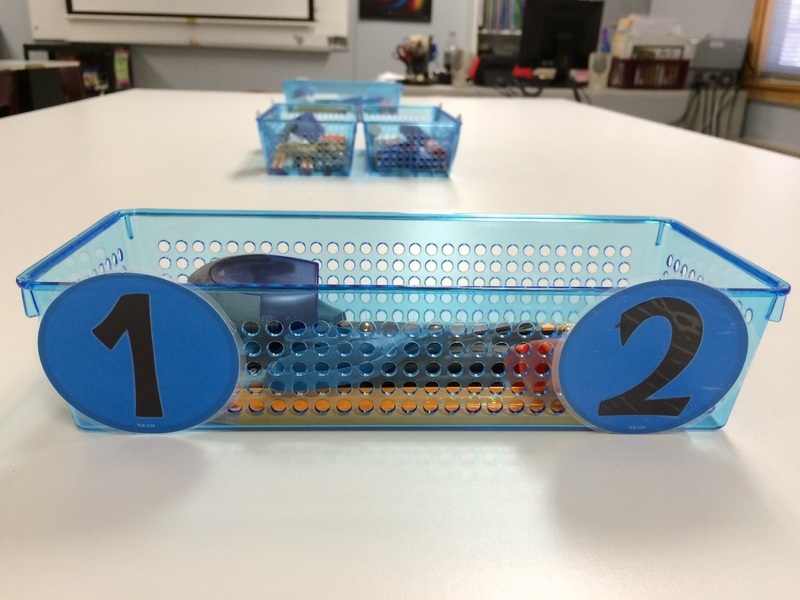 Set up a traffic flow chart to figure out how students will move around the room. 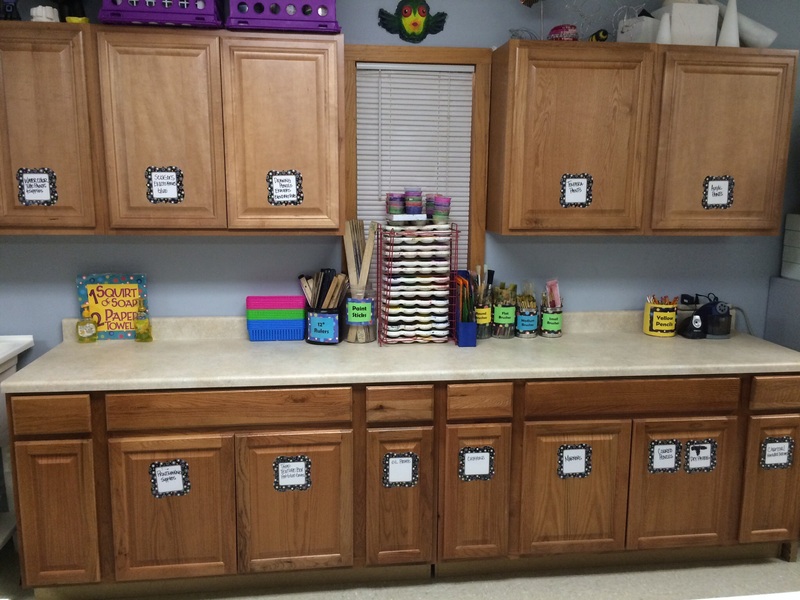 Place feet or arrows on the floor so students will see the direction they need to move. Know what you have! 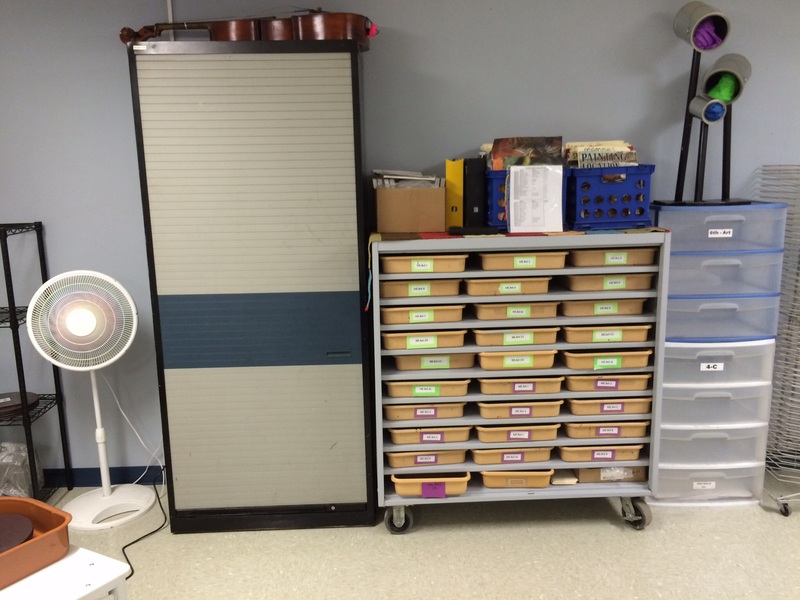 Look at the supplies you have and decide the best way to organize them. Use what you have- Almost anything can be painted! If you need different storage, find new-to-you furniture at garage sales, thrift shops or Craig’s List. Then buy a gallon of paint (with primer in it) & paint everything to match-color ties it all together. Be willing to do something different! Change can be good, embrace the opportunity to make some needed changes (isn’t that true in life too!). So here are pictures of my new room. 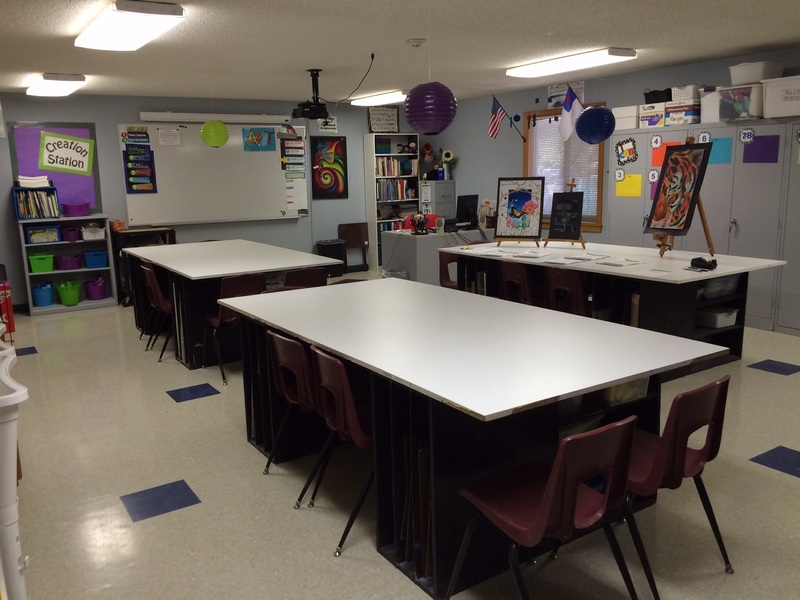 Do YOU have tips for setting up a classroom? Please share with us all in the comments below-we learn from each other! If you use any of the content from this post (written or images), please link back to my blog Create Art with ME!